TASSIMO is not just another coffee maker. It's a whole new way to prepare a variety of delicious hot drinks perfectly, in the comfort of your own home. And it's so simple. 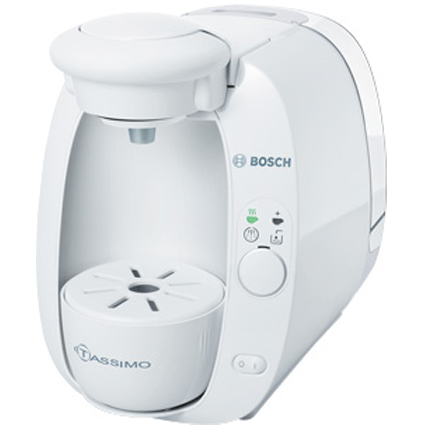 Each ingenious TASSIMO T DISC is designed to work exclusively with the TASSIMO system. T DISCs contains a precisely measured amount of coffee, tea, chocolate or concentrated milk creamer. The brewing happens inside the T DISC. Your beverage pours directly from the T DISC into the cup, so you can prepare different drinks one after another. When you insert a T DISC, the brewer reads a unique bar code printed on the label. It then automatically calculates the amount of water needed, brewing time, and temperature to prepare the perfect beverage. •Brewer dimensions: Width: 7.88" ; Height: 11" ; Depth: 11.75"
We are huge fan's of TASSIMO (our TASSIMO T65 is currently my favorite appliance in our kitchen), and that appreciation only grew deeper after experiencing the TASSIMO T20 Brewbot (pictured above and below). Offering the same barcode technology as the T65 machine in a smaller design, it's perfect for city living. The T20 does not demand a huge amount of counter space, making it perfect for apartments or even as a personal brewer for the office. By simply filling the water tank, inserting a T DISC, and pushing the button the TASSIMO brews up the perfect beverage in just under a minute! What sets this machine apart from the rest, is it's ability to make TRUE Late's, Cappuccino's, and Crema Coffee (with the use of the milk / dairy / non dairy T DISC 's). Adding to the machines unique design, you can customize the color by adding a color accessory kit (the custom color plate & beverage stand simply snaps into place). Don't be deceived by it's size, the TASSIMO T20 Brewbot may be small....but it's MIGHTY in it's brewing ability. Give the Coffee Enthusiast in your life the Gift to Brew up their Coffee House Favorites from the comfort of home (or his desk) with the TASSIMO T20 Brewbot by Bosch! Visit http://www.tassimodirect.com/ and let me know which beverage brand you can't wait to try. The comment is considered your entry. NOTE: You must first be a PUBLIC FOLLOWER through Google Friend Connect to enter any of the Giveaway's offered on One Savvy Mom. Entry to this giveaway ends on July 13, 2011.Winner's are chosen randomly through random.org.The winner will be announced within 7 days of the giveaway ending and contacted through email. The winner will have 48 hrs. to respond or another winner will be chosen. DISCLOSURE: A product sample was provided for review/giveaway purposes. I am not required to write a positive review. The opinions I have expressed in this post are my own. I am disclosing this in accordance with the Federal Trade Commission’s 16 CFR, Part 255. 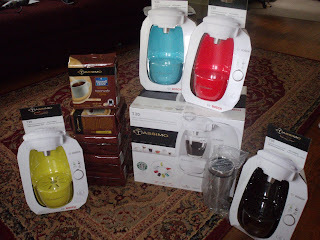 We would love to try the Starbucks Cappucino or the Hot Cocoa in the Tassimo. Wow, I didn't realize it could do cocoa and tea too! Entered to win "a pair of ableplanet EXTREME™ Foldable Active Noise Canceling Headphones With LINX AUDIO® (RV $149.99!)" I'd love to try the Carte Noire Voluptuoso Coffee!